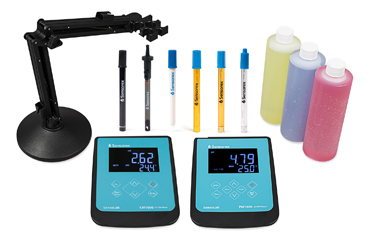 The new SensoLab benchtop meter series from Sensorex offers researchers a more complete sensing system with its pH/ORP/conductivity meters and kits. The new PM1000 and CM1000 meters pair with Sensorex’s laboratory sensors, which include basic, advanced and research-grade options to maximize measurement accuracy and sensor lifetime in applications from hydroponics to biomedical and pharmaceutical research. Configurable kits simplify the product selection process. The SensoLab meters provide accurate, reliable measurement. An intuitive interface guides users through set up, calibration and measurement, with easy-to-read prompts and results displayed on its integrated screen. A small footprint saves valuable desktop space. The meters can be powered either by the included AC adapter or with AA batteries to eliminate cords. The SensoLab PM1000 pH/ORP meter covers the range -2.00 to 16.00 pH with +/- 0.01 pH accuracy and -1999.9 to 1999.9 mV with +/- 0.05%FS accuracy for ORP. Its optional AUTOLOCK feature ensures repeatable and reliable pH and mV measurements. The SensoLab CM1000 TDS meter analyzes conductivity or total dissolved solids in samples, and works with probes across four different cell constants. Its intelligent auto-ranging capability automatically selects the best conductivity measurement unit based on the sample type. Sensorex’s SensoLab kits provide ready-to-use options, packaging the SensoLab meter with a choice of four sensors and a set of three color-coded buffer solutions. An optional electrode stand can be added for hands-free and continuous measurement. Since 1972, Sensorex has been a global leader in the design and manufacture of quality electrodes and sensors for water quality and process applications. The company is approved and certified by NSF International to the ISO 9001:2008 standard for the design and manufacturing of laboratory and industrial analytical sensors for aqueous solutions. Sensorex offers more than 2000 sensor packages for pH, ORP, conductivity, dissolved oxygen, free chlorine, chlorine dioxide, UV transmittance and other specialty measurements, as well as a full line of sensor accessories and online transmitters. Its expert technical support engineers solve analytical sensor challenges with custom OEM designs and off the shelf products. Headquartered in California, with a global distributor network, Sensorex is a subsidiary of Halma plc, an international market leader in safety, health and sensor technology.